Recent events in Chile and Haiti remind us of the devastation that can be brought by an earthquake, especially when it strikes without any warning. For centuries, people living in regions that are more susceptible to earthquakes have reported a number of strange occurrences immediately prior to a large quake. This includes unexpected weather phenomena and even unusual behaviour among animals. Now some scientists have suggested other precursors, such as sporadic bursts of electromagnetic radiation from the fault zone. Unfortunately, none of these suggestions has led to a reliable scientific method for quake prediction. What does this have to do with radon? 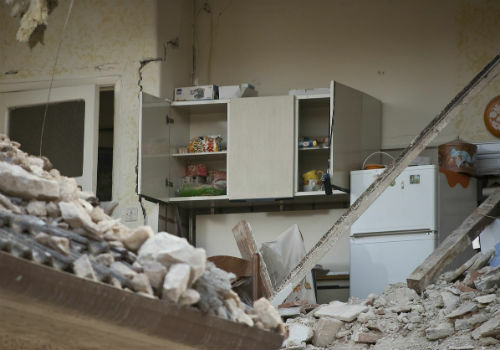 A group of physicists have developed a new detector that could measure one of the more testable earthquake precursors, the suggestion that radon gas is released from fault zones prior to earth slipping. In the last 10 years, several studies have concluded that elevated concentrations of radon gas in soil or groundwater could be the sign of an imminent earthquake. It’s believed that the radon is released from cracks as the Earth’s crust is strained prior to the sudden tectonic plate shift of an earthquake. In order to test this hypothesis, researchers would need to deploy several hundred detector devices along a fault zone. Although in theory several commercial devices could perform this task, these devices are too expensive for large-scale application, nor is it clear whether many of those devices would still work in water. How does this new detector work? According to an article posted on PhysicsWorld.com, this alternative detector consists of a wire-type counter where particles such as radon enter a gas-filled container and ionize some of the gas particles. The resulting ions and electrons are accelerated by a potential on the wire, causing a cascade of ionization that results in a current in the wire. One key feature of this new detector design is that it works with ambient air, thus avoiding the need to keep refilling the detector’s ionization chamber with a particular gas. It also has a high efficiency, which was achieved by including multiple wires in the ionization chamber. In laboratory tests, the researchers report a radon count of 140 Bq.m–3 over one minute, which is comparable to that offered by commercial devices. The tests also show that the device still functions in 70% humidity, while single-wire detectors start to falter at just 30%. In using the ionization of air the researchers have “broken a taboo” in detection. The new detector detects alpha particles, which is all that is needed to detect heavy radioactive contaminants. Even if the chances of succeeding are slim, the reward would be so immense that it’s for sure worth investigating.